Containing in‐depth and easy‐to-understand coverage of the real estate finance industry, this classic text has trained over 100,000 real estate professionals. 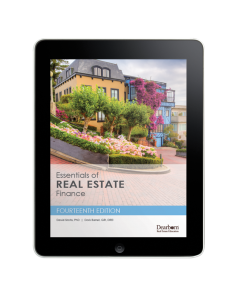 Essentials of Real Estate Finance can be used for prelicensing for salespersons and brokers, or in semester-length courses in two‐ and four‐year colleges. Features include “In Practice” and “For Example” sections, review questions with detailed answer rationales, and a complete glossary. Click the product image to view additional information about this title.